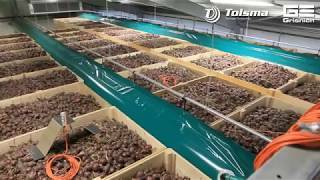 Tolsma-Grisnich designs and builds systems for the processing, storage and cooling of potatoes and onions. This family-owned business serves customers around the world from its base in Emmeloord. Tolsma is known for its innovative storage systems that assure customers of the very best storage results. Grisnich specialises in customer-specific installations and turnkey projects for the receipt, transport, bunkering, cleaning, sorting and packing of agricultural products. Last year the management team launched a plan to boost productivity. One of the spearheads was to achieve greater efficiency in the design department. Cadac Care has enabled them to take the first steps in this direction. The aim is to achieve five percent higher productivity per year. Cadac Care is making this possible! Hans Gaillard is the interim manager for operations, and is responsible for an efficiency drive in the Grisnich design department. On taking up his position half-way through 2016/at the beginning of 2017 he found that administration of the CAD systems was taking up a great deal of time, migrations and updates were being postponed and that training of the 18 designers was not taking place consistently. Gebbe Meffert consulted with his own managers and came back a few weeks later with a concrete proposal that was immediately taken up with enthusiasm. “It's a completely new approach to service and administration”, he explains. “We have taken the lead in terms of administration for the entire engineering department in relation to software and systems. The first sessions have already been held. “We are feeling very positive”, enthuses Peter de Moel, coordinator of the design department at Tolsma-Grisnich. “None of us is wasting time on the CAD systems any more, which is producing time savings. We don't need to schedule in any more courses or training and all issues can be left to a set training day that happens once a month. Contact us to book a session now. Want to increase productivity and the level of expertise in your engineering department? Want to increase productivity and the level of expertise in your engineering department? Gebbe Meffert was delighted to get these comments and compliments. “Satisfied customers, that's what we are all about. But, clearly we benefit too. We will now apply this approach more widely in the market under the name Cadac Care. Cadac Care brings a number of benefits. Ask about an obligation-free consultation today and save valuable time in your engineering department. Your best and best paid CAD engineers no longer have to spend time on the maintenance of CAD systems. Maintenance and updates are scheduled without you having to do anything. Clear, unambiguous CAD models can be built. Anyone can take over the work of another person without problem. New staff members can be quickly inducted. All CAD systems are set up with the best configuration. We will assign you a permanent contact person. As an Autodesk Platinum Partner we are always the first to know about new software developments for your industry. Looking for personal advice on how Cadac Care could help your business? Right from that data management open day, the advantage of NXTdim Inventor was clear: saving time in Inventor.